It's a nice looking place; I'll share some better looks at it with later entries, when I've got a little more time to take them. I really like this theater so far. It being opening night, there were some guests before the films making a few words and announcements. One was from NBC Universal; they sponsored the opening night program and announced that they were expanding the restoration efforts announced for their 100th anniversary a few years ago, with fifteen more silent films being restored within the next three or four years. After that, the film itself was introduced by a man from the Library of Congress. One thing that was kind of cool during all this was that there was an ASL interpreter on the stage during the intros, and a whole section of seating for the deaf/hearing-impaired where he could easily be seen. Kind of a nifty "hey, why don't we do that" thing to consider for the Boston area's silent screenings. Film length can be a killer. At two and a quarter hours, the 1930 sound version of All Quiet on the Western Front is long, especially for its period, but not uncomfortably so. That's a really long silent, though, enough that the intermission is much appreciated, though it still manages to wear. Even taking that into consideration, this is still an excellent movie, one that says just about everything about war, from the march to it to PTSD afterward, and which has seldom been matched in that area in the eight-five years since its release. Lacking sound does nothing to diminish its power. What it does highlight is just how much it did, in some ways, always resemble a silent as much as the early talkies, with fantastic cinemtography and editing (the film is re-cut by Milton Carruth for the silent version, but I don't believe he changed it too much), just as intent on telling the story visually as through dialogue and sound. I suspect this gets mired in conversations that go on a bit long less, but it also never feels like the film is trying to avoid dialogue, either. It helps immensely that there was great accompaniment by the Mount Alto Motion Picture Orchestra, one of the best groups I've ever heard doing this peculiar but exciting sort of work. If Universal includes this version on a future Blu-ray release of the film, I hope they keep this soundtrack. One of the things I liked was how, during combat, the orchestra actually pulled back and let the sound effects guys do their thing. I'm kind of glad I didn't see how they were actually doing the work until afterward; the bass drum rumbling like thunder was obvious, but the microphone which must have been stuck right inside an old mechanical typewriter to give the impression of rifle shots was even better (though it might not have been if I knew what it was beforehand). Full review on EFC (sound version). A pretty good first night, and now it's off to the first full day's worth of films! So, what am I going to have to catch up on after my silent movie binge? I'm pre-caught-up on what's playing at The Brattle Theatre, which is one of my favorites from this year's Independent Film Festival Boston. That'd be Slow West, an unusual western starring Kodi Smit-McPhee as a 16-year-old from Scotland who has come to the American West in search of his true love and Michael Fassbender as the gunslinger who hooks up with him but has an agenda of its own. Perfect casting, beautiful photography, and sly wit make for something pretty great. The only other film on the program this week is the "Reel Weird Brattle: 25 Years Weird" screening of Nightbreed, a Clive Barker-directed dark fantasy about a man who discovers monsters are real and maybe not as cruel as his shrink. As to what I haven't seen, there's Aloha, for a start. It's the new one from Cameron Crowe of Jerry Maguire and Almost Famous fame, featuring Bradley Cooper as a military contractor with an assignment in Hawaii, where he's got unfinished business with an ex-girlfriend (Rachel McAdams) and new romance with his military liaison (Emma Stone); there's a great supporting cast as well. It's at the Capitol, West Newton, Apple Fresh Pond, Fenway, Boston Common, Assembly Row, Revere, and the SuperLux. Less prestigious-looking is San Andreas, which promises a Richter-9 earthquake in 3D (or 2D, if you prefer) with Dwayne "The Rock" Johnson having to rescue his stranded daughter in the middle of it. That's at the Capitol, Apple Fresh Pond, the Embassy, Jordan's Furniture (Imax), Fenway (including RPX), Boston Common (including Imax 3D), Assembly Row (including Imax 3D), Revere, and the SuperLux. Some theaters are apparently also opening Entourage: The Movie on Wednesday (which means Tuesday night these days). Kendall Square has three new movies opening this week. The biggest is IFFBoston selection Sunshine Superman, a documentary on Carl Boenish, the daredevil who created BASE jumping and seems to have been fortunate in finding a woman who loved adventure just as much as he did. The other two are in French, though from different parts of the world. Montreal, QC is the source of Felix et Meira, a romance between a cut-off francophone and a Hasidic single mother. From France comes In the Name of My Daughter, in which Catherine Deneuve plays a mother who spends nearly three decades investigating the disappearance and presumed murder of her daughter (Adele Haenel) after a failed suicide attempt. The first is booked for one week, the second planned as a more open-ended run. The Coolidge Corner Theatre and The West Newton Cinema pick up I'll See You in My Dreams, a nice senior romance with Blythe Danner that played IFFBoston and also opened at Kendall Square last week. The Coolidge also has a late-night "opening", with The Human Centipede III: Final Sequence playing midnight on Friday & Saturday; with any luck it's the end of the line for that one. They also have Clue in 35mm for those nights; no word which ending(s) play which night. Monday night is "Big Screen Classics" night, and this week's presentation is the Maysles Brothers' documentary Grey Gardens, a cult classic look at former socialites in a decaying house. Thursday night's "Wine & Film" presentation is A Year in Champagne; no guesses what sort of wine will be paired with it for a tasting. The Lav Diaz series at the Harvard Film Archive reaches its end this weekend, with one film of "normal" feature length - Hesus the Revolutionary on Friday night - and one last marathon, the six-hour Century of Birthing at 4pm Sunday. I'm ashamed that I didn't have the guts to try at least one of those monsters. The Museum of Fine Arts continues their run of Nuri Bilge Ceylan's Winter Sleep, with screenings on Friday, Saturday, Sunday, and Wednesday. On Thursday the 4th, they will be screening American Denial, an hour-long documentary on race in America that hearkens back to Gunnar Myrdal's 1944 study while also focusing on contemporary issues; director Llewellyn Smith will be on-hand for a Q&A afterward. The Institute of Contemporary Art has two film programs this week. Friday night is their annual "Fast Forward" screening, a presentation of shorts created by local teenagers in the museum's Teen New Media program; it's free for teens. Saturday and Sunday, there are a total of three shows of local film critic, director, and Archie fanatic Gerald Peary's new documentary Archie's Betty, in which he tries to track down the real-life inspirations for America's Typical Teen-ager and his friends. The Capitol wraps up "Mel Brooks in May" with Spaceballs at 11pm on Friday & Saturday; no word yet if they'll be having late shows in June as well. The Somerville Theatre has a special show on Thursday - I Need a Dodge - Joe Strummer on the Run, an off-beat documentary about the Clash frontman who, while spending time in Madrid, bought a car and forgot where he parked it, asking people to help him find it twelve years later. The Regent Theatre has its first screenings of this year's Spike & Mike animation programs on Friday, with the "regular" festival at 8pm and a 10pm show for the "Sick & Twisted" festival (which is what most people probably think of as "regular" for Spike & Mike, but since they're not calling the other "classic" this year it gets confusing!). My plans involve silent movies in San Francisco through Sunday, air travel and baseball on Monday, and then we'll see just how crazy the rest of the week is looking at work before thinking about Aloha and San Andreas. Man, sometimes you really have to go out-of-town if you want to see a movie in the theater. 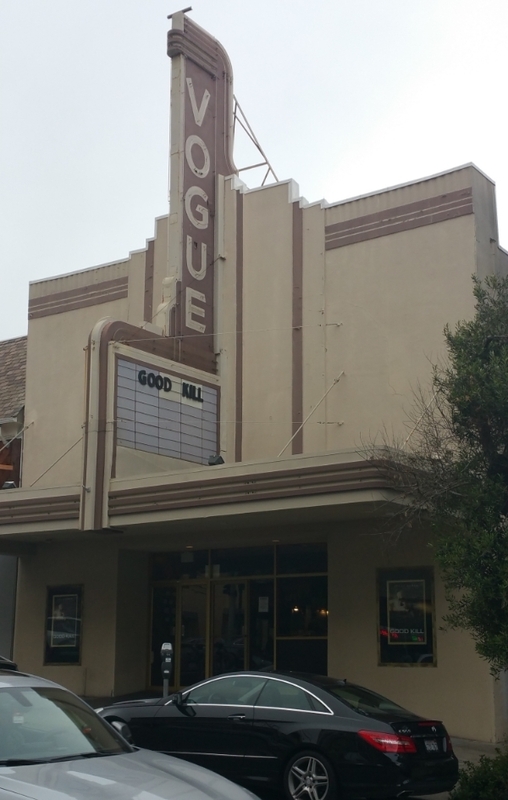 That's the Vogue Theatre in San Francisco, not quite as far from Boston as you can get and still remain in the continental United States, but, yeah, a bit more of a hike than West Newton. I'm out here on vacation, finishing up with the Silent Film Festival, because I really just can't resist the first (North American) screening of the 1916 Sherlock Holmes with William Gillette in decades. Still, it's always neat to check out some of the other local places, and this was the only place in SF playing the film. Surprisingly, it's a single-screen spot, which seem more common here than back in Boston. It seems to be part of a larger group - there were posters promoting things playing at other local theaters, but that still seems like a risk with a film that's apparently also playing on demand. It's a nice little place, and I was able to try an "It's It" - an ice cream sandwich made with oatmeal cookies dipped in chocolate - so a bit of the local snacks as well. 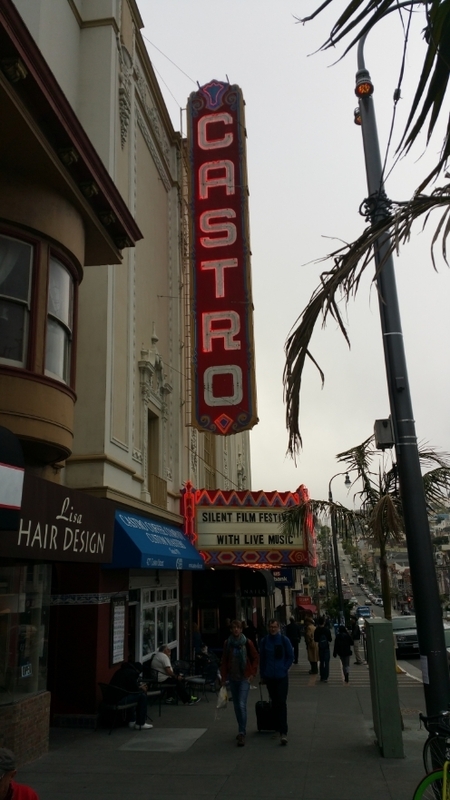 I'll be spending the next three and a half days at the Castro, which I gather is something else again. As to the movie, it's pretty good, as Andrew Niccol's movies with Ethan Hawke tend to be, although he hits his central ideas hard. I enjoyed it as I was watching it although writing about it tended to emphasize that subtlety is not Niccol's thing. Still worth checking out if you can find it at a theater or on VOD otherwise. Writer/director Andrew Niccol has never been a guy who had a problem with letting the audience know exactly what he is getting at with his movies, and that's certainly the case when he sets his movies in the recent past rather than the indefinite future. Surprisingly, Good Kill does a fair job of doing more than just preaching to the converted about the questionable ethics of drone warfare. Its measured approach may not appeal to all, but it does make the film fairly effective. It takes place in 2010, when the American military's use of Unmanned Aerial Vehicles in the middle east reached its height. Air Force Major Thomas Egan (Ethan Hawke) operates one from a base just outside Las Vegas, and it's wearing on him: Though he can go home after spending his day in an air-conditioned trailer, he's distant from his wife Molly (January Jones) and drinks too much. He's asked commanding officer Lt. Colonel Jack Johns (Bruce Greenwood) to be reassigned to flying real planes, but that's not the way the military is headed. When his partner fails a drug test, Airman First Class Vera Suarez (Zoë Kravitz) is assigned to the team, and her discomfort with some of their missions only intensifies when they start getting jobs direct from the CIA. Though Niccol allows the arguments for the use of UAVs their moments, this is an anti-war movie at heart, and like most such films, must wrestle with the basic fact that combat is more easily made exciting on-screen than the various alternatives. Fortunately, he has a good handle on where he wants to go with these scenes, not presenting them as so technical that they become tedious for the audience, but de-emphasizing what might be cool: Everything outside Nevada is clearly a computer screen even when it fills the entire cinema screen, so there are no visual effects shots emphasizing how amazing it is that a missile fired from two miles up can hit a human-sized target. Indeed, the impression given is most often overkill, and any suspense in those scenes generally comes from the worry that something horrible will happen as collateral damage. Potential secondary theme for this pairing: Movies with basically the same title released in close succession. Although the Italian Reality was released a little longer ago than I remembered (about two years), it's only been about six months since I last saw a movie named "Roar" about idiots who antagonized feline carnivores much larger than they were. These two played the same room a week apart - although mainly because Roar got held over a second week, presumably so that those of us busy at IFFBoston the previous week could see it (why yes, I do think about the Coolidge's schedule as being made for my convenience - don't you?). It was apparently a full moon, or at least that was one explanation, because some guy in the downstairs theater got really unruly, was kicked out, kept trying to come back in, spat on someone... Eventually the police were called, and let me tell you the 66 bus does not stop when there are six Brookline PD cars dealing with a guy on the other side of the road. Apparently the guy actually was worth not messing with so me having to walk home was no big deal, but that was a reminder that for all I would probably open a theater if I ever came into the appropriate amount of money, there are a lot of good reasons why I don't miss working at one at all. What's kind of interesting to me is that they are both pretty midnight-specific releases. Roar will be playing the Brattle at regular hours this week, but it will still be a midnight movie in spirit, with audiences kind of coming to look at the trainwreck. Reality comes from a guy who has made a few oddball niche movies and by now the distributor pretty much knows what they're getting. I do have to say, though, that it's kind of a weird good news/bad news situation that IFC Midnight saw the new Dupieux movie as the sort of known commodity that it wanted to snap up right away. It looks to have only played a couple of festivals, which meant that nobody was really talking about it or building up any sort of buzz for a pretty good movie; it showed up on the Coolidge's website a couple of weeks before release, and only those of us who check that pretty regularly knew it was coming. Everyone else is looking at VOD, and I bag on that a lot, but how does anyone know what's available on that? Does this make it easier for movies like Reality to just disappear down a hole? I harp on this a lot, I suppose, but I hate missing stuff, and barring the old "choose a new title that starts with 'A'" trick, how does something like this get attention, especially if Reality or Maggie isn't going to hit the specialty festival circuit? That Roar never got much of a theatrical release when it was new may be for the best. It means that very few have ever approached it expecting something conventional and been disappointed on that count. Instead, just about everyone who buys a ticket or sends it to their television knows that they're getting the insane movie made with semi-cooperative big cats, and will basically accept it for what it is. After all, the behind-the-scenes story of this thing is far more interesting than the movie's plot. In some ways, though, they're kind of the same: An animal-loving American (writer/director/star Noel Marshall) goes to Africa and spends a lot of time at a an animal preserve, eventually bringing his family (wife Tippi Hedren, stepdaughter Melanie Griffith, sons John & Jerry Marshall), and having chaos ensue as they arrive at a house where the local animals have more or less free reign. In reality, Marshall's family also got to know the animal cast, while in the film there's some business with poachers that keeps "Hank" from meeting "Madelaine" and the kids on time. How much the alpha lion of the local pack was actually having issues with a nearby rogue in real life is unclear. I like to imagine that the phrase "you insane American dilettante" was cut from the end of every line Kyalo Mativo spoke; he spends most of his screen time paired with Noel Marshall and that's what the incredulous look on his face seems to be saying. Everything about this movie seems to be barely controlled madness, and the distributor is certainly using that as a selling point, highlighting how seventy members of the cast and crew are injured in some way while the animals were completely unharmed. Perhaps a more telling (and less vicious) way of pointing out how chaotic this project was is that the animals are described as co-writers, because they just did what they wanted, no matter what the script says. A sad thing about how peculiar movies like those made by Quentin Dupieux are likely to be more readily available to a larger audience via the various on-demand services is that I'm certain that, at some point while making this film, he smiled upon imagining people going to a cinema box office and asking for "a ticket to reality". Or "un billet à réalité", since he's French. I suppose selecting "Reality" from a set-top box's menu works too, although it's not the same as saying it out loud. Either way, you'll wind up with something else entirely, as entertaining and odd as his previous features. "Reality", in this case, is a girl of about ten (Kyla Kenedy), who is very curious about the VHS tapes she saw come out of the stomach of a goat her father was butchering. That's not the whole of the movie, of course - over in Los Angeles, Jason Tantra (Alain Chabat) is a cameraman for a talk show hosted by a man in a rat costume (Jon Heder), although he aims to make a film of his own. Producer and fellow French expatriate Bob Marshall (Jonathan Lambert) would produce, although he becomes very fixated on the sound people will make when dying, giving Jason forty-eight hours to find the perfect scream in order to secure funding. He's also frustrated by the work of Zog (John Glover), usually a director of documentaries who is approaching his current film about a little girl named Reality in a similarly verité manner. If you are expecting a simple film-within-a-film, you probably haven't seen Rubber in a while. This time around, Dupieux aims less to break the fourth wall than to take the whole lot out and replace them with a Moebius strip. Some viewers will play close attention, hoping to find patterns which indicate what level of reality the characters are currently occupying, and maybe they will succeed. I suspect it's a fool's errand, though - there's a pretty good joke or two that suggests he's not all that impressed with movies that key on that sort of gimmick. It's naturally self-deprecating, an indication that he's out to have fun more than blow minds. Very glad to see that this is getting an extended look at West Newton after playing the Brattle. As much as I can sometimes appreciate the urgency that comes with song something booked at that theater - I've missed more than a few boutique-house movies because I figured I could see them during the week, then maybe the next weekend, and so on until crap, it's gone Thursday - sometimes that weekend just doesn't work for you. Anyway, see this one, even if that means... Wow, it's out on video already? That was quick. Or apparently it was just really slow getting to Boston. Wow, that can be frustrating. But now you've got no excuse! Girlhood opens with French teenagers playing American football until the field lights go off, presumably after the teams playing le foot are done with it. Most, if not all, of these girls are black, immigrants or the children of such, and maybe considered not really French by many of the people around them. So they wind up in this isolated world seemingly surrounded by France on all sides, trying to carve their own space as best they can, hopefully as well as the film itself does. The girls peel off from the group until only Marieme (Karidja Toure) is left; she flirts with Ismael (Idrissa Diabaté) and then heads up to the apartment where her family lives. Though her mother Asma (Binta Diop) is the one holding down a job, older brother Djibril (Cyril Mendy) rules the home like a tyrant, and Marieme warns her developing younger sister to wear lose clothing when he's around. Though she wants more, she is told that she does not qualify for high school, and as she gets that disappointing news, she meets Lady (Assa Sylla) and her friends Adiatou (Lindsay Karamoh) and Fily (Marietou Toure). They take her along for shoplifting, parties, and the occasional fight, and it may be the first time that anyone has fully accepted her. It's a hell of a thing to be told at 16 that you are more or less relegated to a second-class life, and Marieme meeting Lady and company at that moment can seem like either conformation that she belongs with the gangs and lowlifes or an immediate counter to the schools' assessment - they see value in her even if the rest of the world doesn't. That is, in general, where the first one or two of the film's four acts spends most of its time, simply showing these girls as enthusiastic, figuring out that they have power as women, especially when they band together. There's not necessarily much plot in the early going as the audience gets to know Marieme and her new friends, and not just them specifically. It's about getting used to how teenage girls chatter and obsess, something that can seem like an annoying din to outsiders but is not so strange once one has acclimated. I said as much in "Next Week in Tickets" at the time, but it is genuinely bizarre to me that the new Arnold Schwarzenegger zombie movie was getting such a tiny opening, at least around here, limited to the Coolidge's 14-seat "GoldScreen", likely because the major theaters aren't going to play something also released on demand and I guess the guys who program Fresh Pond, who will usually give a small screen to something with a recognizable star even if it does have alternate avenues, were full up with Avengers and Bollywood that week. Sure, Arnold is not the draw he once was, but this just seems kind of crazy. Having seen it, I don't know whether it necessarily deserves a wide release, especially when compared to other genre movies of similar scale and ambition that work better even without a Schwazeneggerian element, but just about every week will present a question of what "deserve" matters, and it's peculiar to see the that Arnold's star has diminished so much during his time as Governor, especially since most of what he's done since his return has either been pretty good or had him as one of the best parts. Do people just not like the guy any more, or are they not as taken with "Old Arnold" as many genre fans have been. I also suspect that skipping the festival circuit - including a last-minute yank from the Toronto International Film Festival's "Midnight Madness" program - has not done it any favors. This is the sort of smallish film that needs to own the horror community, and part of that means coverage from Midnight Madness, Fantastic Fest, SXSW midnights, BUFF, and then maybe an earlier release. Instead, Lionsgate basically sat on it until a couple weeks before release, when it played Tribeca. Enough people liked it a lot more than me that the internet certainly could have been cheering for it, but Lionsgate didn't take the opportunity. So it wound up in the tiny room, and as a result I almost missed it. I tend to avoid the GoldScreen from Friday to Sunday, just because I don't like buying tickets in advance (there is a shockingly good correlation between that and having trouble making the start time), and then there were two different problems with the MBTA on Monday and Tuesday. I got there just in time on Wednesday, but, yikes, it can be nice having options when the schedule is tight. Show me Maggie at a genre film festival with a cast of unknowns, and I likely react with unreserved excitement. That is, after all, the natural life-cycle and scale of movies such which play with genre conventions the way this one does. This one's got Arnold Schwarzenegger in the middle of it, and for all that this is intriguing in its own right, it throws things off even more than such an imperfect fit otherwise might. He plays Wade Vogel, a farmer whose daughter has gone missing, which is even worse than usual, as an "necronambulant" plague is sweeping the country. When he finds Maggie (Abigail Breslin), she is infected, and though early quarantine is encouraged, he takes her back to the farm. Soon she will begin showing late-stage symptoms and need to be taken away for everybody's safety, but as another infected family demonstrates, that can be a hard thing to accept. "Hard thing to accept" is the engine that makes Maggie run, more than most zombie movies. As the genre has matured, though, this has become a depressingly standard part of the storyteller's arsenal; that somebody will have to put down a creature that is no longer the person they loved most in the world or will have that as part of their tragic backstory is just a grim inevitability, enough so to have gone from wrenching to cynical. Writer John Scott 3 has not turned the premise inside out the way a team of Korean filmmakers did in The Neighbor Zombie, but he and director Henry Hobson hit on the idea of drawing the incubation period out, and by doing so push it away from being simply device to something audiences will recognize: A terminal disease followed by hard decisions about euthanasia. It's a more direct way of addressing modern fears of plague and disease, from the delusion that you can fight it through shear force of will to how authority tries to keep things together. Last night of the festival, by which point everyone is kind of worn out and it's probably a good thing that we're only in for one film that night. One thing that seemed kind of surprising was just how low-key things felt compared to period years. Brian mostly did solo emcee duty at the big events like opening and closing nights, compared to a larger team in previous years, and while the festival lineup didn't feel scaled-down, especially if you like documentaries, I do think they were stretched a little thinner than usual this year. Hopefully the successful matching-donation drive has them in better shape going into 2016. I don't think I got a single photo of WBUR contributor Erin Trahan and Me and Earl and the Dying Girl writer James Andrews that didn't look goofy or blurry, so we may as well just run with it. As you might guess from looking at it, this turned out to be a really fun Q&A. It was the second of the festival that had someone who interviews for a living directing things, and I think that can really help set the tone, raising the bar for the quality of questions, potentially redirecting the ones festival veterans groan at toward something more interesting and specific, and the like. It also helps that Andrews was an enthusiastic participant. There was a fair amount of talk about how screenwriting requires pretty ruthless self-editing compared to writing a novel, and that adapting your own book might make it even worse - you knew that was good, after all! I'm mildly curious to read the book, because one thing that really makes the movie work is just how visual it is: Greg and (as we layer discover) Rachel are both people who create things in visual media, and they wind up really feeling like they were designed for a movie rather than a book. It's the area where Andrews had to say you'd have to ask Alfonso Gomez-Rejon (the director) most, and I hope some folks did get a few good questions in when a much bigger combo of the cast and crew visited the Brattle a few weeks later. Something else fun: Andrews set the story in the part of Pittsburgh where he few up, and add a result the film wound up shooting in the very house he lived in. How old (now-shuttered) high school, too, unless I'm confusing that with some other movies story. Which can happen when these things are Ttaking so long to get through, but at least I'm finishing this up before the next festival, which is a first for 2015. Some crazy catch-up to get done before Fantasia swallows everything; here's hoping that's possible. There are plenty of reasons to be wary of Me and Earl and the Dying Girl; from the start, it's got a seeming tendency to be glib and self-aware in a way that doesn't always do it many favors. That's why it must eventually be relentless in making those properties work for it, and while I don't really see enough teen-oriented movies that I can conclusively say that this is one of the best in recent memory, it's both impressively well-intentioned and entertaining, and not a whole lot of movies for any demographic manage both at once. "Me", in this case, refers to Greg Gaines (Thomas Mann), just starting his senior year of high school, where he had made a concerted effort to stay on speaking terms with all groups but not part of any; he even refers to his best friend Earl (Ronald Cyler II) as his "colleague" (they shoot silly sort films together). Now, though, his mother (Connie Britton) has told him that Rachel Kushner (Olivia Cooke), a girl in his class he hadn't spoken to in years, has cancer, and he's to go spend some time with her. He's none too enthusiastic, but she turns out to be nice, and actually kind of fun when they are able to get their minds off this horrible thing hanging over her. We see that quickly - the first scene with just Greg and Rachel is one of the film's best. It starts out as this really miserable, uncomfortable thing, two people stuck in a situation that is obviously uncomfortable, but also kind of insulting to them, and in a way the fact that they're both kind of annoyed with being thrown together is what lets them get to the point where they're demonstrating the same sort of sense of humor and throwing their awkward jokes back at each other. It takes very little time to see Rachel as more than a plot device and Greg as more than the too-clever creation of an adult writer. Yes, this thing where I occasionally watch Bollywood movies has reached the point where, upon seeing a trailer for this before Detective Byomkesh Bakshy!, I recognized the entire main cast and said yes, I like them, I'm in. Even if you're not a real fan of Indian film but just sort of generally aware of it (and maybe not even that), the cast of Piku should make you take note: Amitabh Bachchan is an institution who has been popular for decades and patriarch of a major acting family, Deepika Padukone is one of the country's most popular leading ladies, and Irrfan Khan is in tremendous demand in both Bollywood and Hollywood. And, yet, despite what seems like it should be a fun premise, the film is a real bore because this great cast is given nothing to do. Piku Banerjee (Padukone) is an intimidating, pushy woman working at a Delhi design firm, and she comes by it honestly - her 70-year-old father Bhaskor (Bachchan) is just as disagreeable, and in fact his hypochondria is the only thing that can really push her around. When a brush with mortality makes him decide to take a trip back to the family home in Kolkata, they decide (for various reasons) to take a cab those 1,500 kilometers, but both have browbeat the local drivers so badly that it falls to the taxi company's owner, Rana Choudhury (Irrfan). The cast probably did not sign on to Piku because of the creative, never-before-seen story, but that's okay; this is the sort of set-up that a great cast and crew can make sing. The trouble is, writer Juhi Chaturvedi and director Shoojit Sircar seem not to realize that they've got a road trip movie on their hands; it takes a thoroughly unreasonable forty-five minutes for the characters to get into into the taxi for a trip that takes a mere half-hour of screen time before another forty-five minutes in Kolkata. The intermission is placed right in the middle of that time on the road with one of the least exciting cliffhangers ever. You can argue that this doesn't have to be a road trip movie, but it should be; the road is where things can happen because everybody is in close quarters and out of their comfort zone, as well as being a natural way to communicate characters in transition. Heading out of town in two different directions, so what's the point of potentially getting upset about a booking that would otherwise tick me off? I mean, seriously, Good Kill, the new film by Andrew Niccol starring Ethan Hawke, is only playing two shows a day at The West Newton Cinema, with the only other vaguely local option Salem? That's disappointing, since the last time Niccol did this sort of contemporary thing we got the pretty good Lord of War, and having Hawke as an Air Force pilot now operating drones from Nevada is at least interesting material. They will also be opening Saint Laurent (see below) and Girlhood, which played the Brattle for a weekend a few weeks ago and is pretty great. And speaking of bringing things back, listings and an active website have popped back up for their sister cinema, the Belmont Studio, which has been closed since January for various code violations and was written off as dead by a number of places. They'll be running Age of Adaline this week. It's another two-movie week at the multiplexes. The big name is Brad Bird's Tomorrowland, starring Britt Robertson as a girl who finds a secret (but lost) place where geniuses have tried to engineer a better world. George Clooney's in it too. It's at the Capitol, Apple Fresh Pond, Jordan's Furniture (in Imax), the Embassy, Fenway, Boston Common (including Imax), Assembly Square (including Imax), Revere, and the Superlux. There's also a remake of Poltergeist, with Sam Rockwell and Rosemarie DeWitt as the parents and a completely different type of psychic (to be fair, there are some actresses that just aren't easily replaced). Sam Raimi produces, but likely wasn't nearly as involved as Steven Spielberg was with the original. 2D-only at the Somerville, 2D and 3D at Apple Fresh Pond, Fenway (including RPX), Boston Common, Assembly Row, and Revere. It's a fashion-forward week at The Coolidge Corner Theatre, which opens opulent biopic Saint Laurent, which follows Yves Saint Laurent's life from 1967 to 1975 (and shouldn't be confused with the other YSL movie which came out last year). It also plays at the Kendall and West Newton. The Coolidge and West Newton also pick up Iris, Albert Maysles's biography of New York fashion icon Iris Apfel, which opened at the Kendall last week. There's one other new release getting midnight screenings, the nifty haunted-house thriller We Are Still Here, probably my favorite thing from this year's Boston Underground Film Festival. Don't miss it. Joining it for Friday/Saturday late shows is a 35mm print of Harold and Maude. For a holiday weekend, there are surprisingly no other specials aside from Thursday's "Wine & Film" presentation, the obvious but still entertaining choice of Sideways. In addition to Saint Laurent, Kendall Square has IFFBoston selection I'll See You in My Dreams, a nice enough film starring Blythe Danner as a still-vital widow in her sixties who attracts the attention of men her own age (Sam Elliott) and younger (Martin Starr). There's also a one-week booking of Italian fact-based Mafia story Black Souls. It's Reunion Weekend in Harvard Square, so The Brattle Theatre is breaking out the multiples of twenty-five for anniversary screenings: Single features of The Great Dictator (75th) and Faster, Pussycat! Kill! Kill! (50th) on Friday, a 50th-anniversary double feature of The Knack...And How to Get It! & What's New Pussycat? on Saturday, a thriller two-shot of Rebecca (75th) and Repulsion (50th) on Monday, and single programs of My Little Chickadee (75th) and Akira Kurosawa's Dreams (25th) on Monday. They also kick off the next weekly "Reel Weird Brattle" series ("25 Years Weird") at 11:30pm Saturday night with Troll 2. Almost all of these movies are on 35mm, with Troll 2 and maybe Rebecca as the exceptions. On Tuesday, they have the monthly "Elements of Cinema" screening with Charles Burnett's Killer of Sheep at 6pm, followed by a discussion with Boston University's Aaron Garrett. Later that evening (and through Wednesday and Thursday), they have Roar, a rediscovered oddity set on an African wildlife preserve shot with untrained lions. Piku and Bombay Velvet continue to chug along for Bollywood fans, and both Apple Cinemas Fresh Pond/iMovieCafe and Fenway pick up Tanu Weds Manu Returns, which reteams Kangana Ranautand R. Madhavan, and if the trailer I saw the other night is correct, they've broken up/divorced and now Manu is falling for a girl who is a dead ringer for Tanu while she is reconnecting with an old boyfriend. If you speak Telugu, Apple also has Mosagallaku Mosagadu, an action-adventure flick ofsome sort. The Harvard Film Archive presents a pair of linked documentaries on Friday and Saturday: 1975's Torre Bela by Thomas Harlan, which presents a battle between aristocracy and commoners in Portugal from inside, and José Filipe Costa's Red Line, which followed the film and situation up in 2012. Later those nights, Ben Rivers' Midnite Movies return with The Visitor, which is ten minutes of weird surrounding an hour and a half of boring, and Re-Animator (on 35mm), Stuart Gordon's bizarre Lovecraft tale. Then, on Sunday, it's another Lav Diaz marathon, with the seven-and-a-half-hour Melancholia starting at 2pm. The Museum of Fine Arts starts a sporadic run of Winter Sleep on Friday, Wednesday, and Thursday (continuing through 3 June); it's the latest from Turkish filmmaker NuriBilge Ceylan. In it, a former actor who now runs a hotel with his wife gets snowed in with his sister. They also have a second weekend of The Boston International Children's Film Festival on Saturday and Sunday, with more screenings of Moomins on the Riviera, Mune, and two short blocks, as as well as and English-dubbed version of French/Belgian animated film Wolfy, The Incredible Secret. The Capitol continues "Mel Brooks in May" with Blazing Saddles at 11pm on Friday & Saturday. I'll be heading north for a family thing on Saturday, at the ballpark Sunday, and flying west for vacation (which includes the San Francisco Silent Film Festival) on Monday, so it likely won't be a big movie weekend. Probably Tomorrowland, maybe Faster Pussycat, and then see if Good Kill is playing in SF before the festival. Today in "different priorities at film festivals", I talk about how I mostly try to prioritize movies that I might not otherwise be able to see, so when the last two days of IFFBoston come and it's basically "stuff that's already got distribution and will open on this very screen in a couple of weeks"... Well, it's cool that those coming for Q&As or to see things early got some of that. First up: I'll See You in My Dreams writer/director Brett Haley, who was genuinely thrilled about having gotten that distribution and had plenty of stories about how Blythe Danner was terrific to work with, especially since the song she chose for the karaoke scene (one she had sung in cafes herself when younger) fit the film so well. A lot of talk about being a younger guy making a film about older women as well. 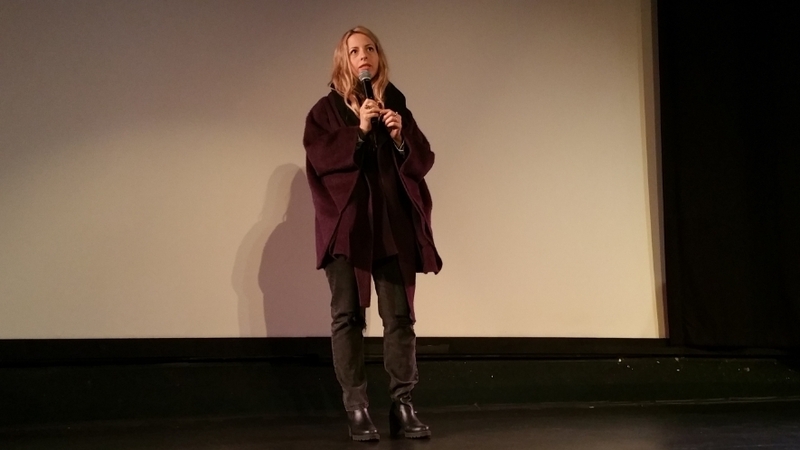 Next up was Crystal Moselle, who made The Wolfpack, giving the sort of Q&A that I tend to think of as "frustratingly informative". A lot of questions were built from premises that it was easy to infer from the film but which are not actually the case - for example, it is very easy to assume that the family has lived in that apartment for the kids' entire lives, which is not what happened. We also learned that she met one of the kids on the street, after they had started going outside, and kind of followed him home. There were other things mentioned, such as why we don't see much of the sister (she's developmentally disabled, so the feeling is this would be exploitative). It gave me a bit of a weird feeling - shouldn't this stuff have been in the movie? It's more interesting than a lot of stuff that was, after all! But, on the other hand, is it not in some ways very impressive editing that she was able to build the film that shuffled a lot of things that were not so important to the story she was looking to tell off to the side? Probably. Thing to ponder: I can put a note in my phone or computer that says "revisit I'll See You In My Dreams twenty-five years from now", and it could follow me from device to device over that time, and it will actually remind me to give this movie I liked well enough in 2015 another look with the proper amount of life experience. I like it; I'd like to see how much it speaks to me at that age. It focuses on Carol Petersen (Blythe Danner), an independent widow in southern California. Though best friend Sally (Rhea Perlman) and the rest of their bridge game (June Squibb & Mary Kay Place) live in a nearby retirement community, she's still in her own home, which has its minuses, such as when a rat startles her into sleeping on the back porch. New pool cleaner Lloyd (Martin Starr) finds her and strikes up an unlikely friendship, later meeting up for karaoke. She and the new guy at the complex, Bill (Sam Elliott), also catch each other's eyes. And that's kind of where things stay, for the most part; this isn't really about building to something as much getting snippets of Carol's life at what's not exactly a turning point but is maybe the most interesting it's been in a while. There are bits that could probably be popped out of the movie with little damage and others that have a bit of padding around moments that nudge things forward. It's a pace that can aptly be called "retiring", not exactly slow but with even the significant moments a bit muted. These people are at a point in their life where disastrous decisions are likely, and the movie reflects this. I suspect that film fans are going to talk The Wolfpack up more than it truly merits; the only thing we like more than an amazing story is meeting folks who love movies as much as we do, and there's no denying that this movie has both. The thing is, while "meeting" the Angulo brothers certainly makes one want to like the movie, I wonder how much it will hide the film's flaws to those who aren't the same sort of fanatics. When director Crystal Moselle met the half-dozen brothers, they lived in a small New York apartment with their parents, home-schooled, almost never leaving the building. In many ways, their only connection to the outside world is through movies, which they love, devour, and meticulously recreate. They spend hours transcribing the dialog, building cardboard props, and putting together costumes, all within the confines of just a few rooms - but what happens when one finally gets the courage to go outside? The first movie we see the boys recreating, right at the start, is Reservoir Dogs, and it's kind of interesting that Moselle starts with them re-enacting a Tarantino movie - as much as he's an extremely talented director, he is also famous for constructing his films from other bits of pop culture rather than creating things from whole cloth. Is there some significance to the fact that much of the first thing we're seeing is in some ways a copy of a copy? Hey, they booked it that way, so this isn't just me being weird. I was kind of let down that I didn't get to go to Friday night's Big Bird shows with Caroll Spinney on-hand - they were sold out well ahead of time and I generally can't bet on arriving for movies on time working out in Burlington. Sure, the odds would be good, but not guaranteed. It's a bummer, because Spinney brought an Oscar the Grouch puppet and I could have probably snapped a selfie that would make my nieces green with envy (plus, yeah, interacting with Oscar would be a lot of fun). There was a bit of time between the two films which I used to hit the ATM to get some money for snacks and see, hey, the big check I'd written for first/last/security for the new place had been cashed, and if I did the match for the fees still owed and another month's rent on the current place... Well, it was looking close. I say this not to gain anybody's sympathy, but to note that I went into Lost River with a bit of housing/money-related anxiety, the first I've felt in some time, and it couldn't help but color my perception of the film. I'm not sure whether that's the best or worst state of mind in which to see that particular movie, and I think I'd have really liked it anyway. Just a couple of things that could really shift the experience of seeing a movie that the filmmakers can't hope to control. There was another documentary about the man behind one of Sesame Street's most beloved Muppets a couple years back, and even before it certain allegations (most later rescinded) were made, it didn't really feel like Becoming Elmo gave the viewer a complete picture of Kevin Clash. I think that I Am Big Bird does a better job of giving us a full picture of Caroll Spinney, perhaps because less is being held back, perhaps because he's had a longer life to draw from. Of course, it probably also doesn't hurt that this viewer is of an age that Spinney's greatest hits as Big Bird and Oscar the Grouch hit the nostalgia button a lot harder than Elmo's. There are still some things that seem to be a little bit under-played in part because they don't help the film's general aim of showing just how much of Big Bird's sunny, inquisitive outlook on life comes from his puppeteer. Interviewees will half-joke that Spinney is also Oscar, for instance, and it might be interesting to draw a line between that and the darker periods of his life. That one of the show's long-time directors apparently didn't get along with him is brought up just long enough to seem like more than an oddity but then dropped quickly. Granted, the few minutes these things get in a ninety-minute movie are probably proportional to their actual importance, but it does feel a little bit like something is being held back. When filmmakers Dave LaMattina and Chad N. Walker stay on target, on the other hand, they do a fine job of getting this idea across. Spinney is an engaging subject, coming across as friendly without ever seeming calculatingly ingratiating, and though he seldom if ever gives a name or label to it, he's impressively open about how he has struggled with various types of anxiety over the course of his life. Both Caroll and Debra Spinney seem like warm people who have grown comfortable with their own lives, and though this is clearly Caroll's story, even when the two are being interviewed separately, Walker cuts their relating the same things together to emphasize their closeness. Filmmaker Ryan Gosling thanks a number of filmmakers toward the end of the credits to Lost River, some of whom he has worked with as an actor, and of that group, it's Nicolas Winding Refn who leaps to mind when watching Gosling's first film as writer/director. The influence of Drive and Only God Forgives is unmistakable, and Gosling uses what he learned working on those films to create a stylish, haunting tale of his own. Lost River is a town in Michigan, likely not far from Detroit, and like that town it's collapsing, with houses becoming overgrown as the residents cut bait and move south. Single mother of two Billy (Christina Hendricks) aims to stick it out, but she's three months behind on the mortgage and the job that the new bank manager (Been Mendelsohn) refers her to would not be her first choice. Older son Bones (Iain De Caestecker) aims to leave as soon as he's got his car fixed, but his only source of income is scavenging copper from abandoned buildings, and a cruel thug calling himself Bully (Matt Smith) aims to corner that market. It's while fleeing Bully that Bones finds a road that leads underwater; girl next door Rat (Saoirse Ronan) explains the local lore. The characters in this film have names out of a fairy tale, but Gosling sets his sights higher, stretching toward the mythic in his conception of societal death and rebirth, building toward parallel climaxes where Billy and Bones journey to separate underworlds. For Billy, it's a grotesque man-made version of hell designed to damage her soul in exchange for the money she needs to stay. Simple prostitution would almost am to let her off too easily, so Gosling instead creates a situation where she has trapped herself in a place where death and decay are seen as entertainment. 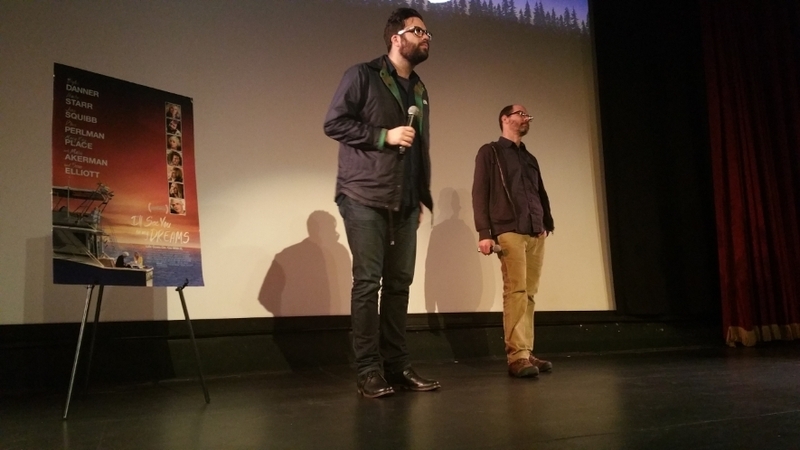 Monday at IFFBoston is always kind of a quiet day, nestled between the weekend Gorge and the last two days of films that the organizers seem so confident of that they get a competition-free showcase. It's full of choices that are less agonizing than reluctant. I went for Manglehorn in the first slot; it was one of those where I scam the description, think it sounds good bit will play theaters, but then get reminded that the director is David Gordon Green and his last movie's release was a blip (plus, it may hit Boston while I'm in Montreal). It was pretty good; not a choice to regret by any means. The 9:30 block was a little tougher; it was between Posthumous and Future Shock!, with the former winning out until the last minute - nice cast, amusing premise (artist invents a twin brother when erroneous reports of his death send the process of his work through the roof) - especially since I've read a fair amount about 2000 AD's early history in the Megazine. Ultimately, though, I sort of figured that if Nancy, Brian, and company we'd going to program a movie so specifically asked at me, it would be terribly ungracious not to go. Kind of a shame no local comic shops were there as official presenters. I know there are about three of us that subscribe at the Million Year Picnic (and I was the only one of that group at the movie). On the other hand, it looks like they gave away a fair number of samplers at Free Comic Book Day later in the week. It works out that the next batch of comics to come in after the screening is all new stories, so a great place to start, too. I hope some of the folks who came to the movie start picking it up, at least; it's more than Judge Dredd, and that isn't bad itself. David Gordon Green seems to make movies in spurts-first some noteworthy independent dramas, then some crude studio comedies. Now, a year after doing Joe and reminding audiences that, yeah, Nicholas Cage can act a little when he decides to apply himself, Green has teamed up with another actor who does not always choose roles that match his talent level, Al Pacino. The results are not bad at all, although it can at times be hard to embrace them. Pacino plays the Manglehorn of the title, A.J., a locksmith in a small Texas town. Though not shy about offering his opinion, he is fairly private, spending most of his time at home with his ailing cat. He's fond enough of a certain teller at the bank that the line knows to go around him so that he can talk to Dawn (Holly Hunter), although the true love of his life left him forty years ago, and as the daily letters returned to sender and shrine in his house indicate, he's not close to being over it. Manglehorn is a character who could really play to Pacino's worst habits, having a tendency to go from charming to blustering rage without necessarily having a whole lot of space in between. Fortunately, he and the filmmakers realize that he doesn't have to charm the audience here, and can instead play up the lower-key ways that someone can be anti-social or consumed by an obsession. Pacino perfectly zeroes in on the tone that will push the person he's talking to away even while A.J. is outwardly trying to be friendly, and it's a performance that makes the audience just put off enough that when Managlehorn shows us his worst, it's not a betrayal but it's still fairly shocking. 2000 AD is not the only comic that could believably have its history scored with punk rock, but most of the rest burned out fast, or never made any sort of popular impact. 2000 AD has been a big deal for the better part of 40 years, and while Future Shock! may not be telling fans a lot that they don't already know - regular artist "interrogations" in the Judge Dredd Megazine do a good job of keeping the history alive - it's a good overview. After all, it's always nice to have something to point to when someone asks me why this comic is kind of a big deal. For those that don't know, 2000 AD is a weekly British sci-fi anthology comic that started in 1977, created and edited by Pat Mills, who figured that the futuristic material might help it avoid the controversy that had doomed his previous magazine, Action!, despite its popularity with its target audience of young boys. Over the years, the magazine would launch dozens of popular characters - the most well-known being Judge Dredd - as well as the careers of comic-book creators popular on both sides of the Atlantic. There aren't exactly a lot of surprising twists and turns to the story - people came and made comics, often moved on, but the magazine endured with new writers and artists. Director Paul Goodwin does a good job of building a sort of progression out of it anyway, generally moving forward in time but also bending the timeline so that he can examine a character or feature and talk about how it is relevant to the book's history and evolution. Judge Dredd, for example, is able to endure because it works both satirical commentary and as an example of what it parodies without losing equilibrium, making him a bit harder to outgrow. In particular, Nemesis comes across as very personal for Mills. There are Chinese movies which slip into American theaters under the radar, and there are things like this, which appears to have opened in Boston on the 8th but which didn't show up on the theater's website when I was checking it late on the 7th, and wasn't on the MoviePass app when I finally saw it listed on another site/app during the week. I almost wonder if it didn't start until Monday the 11th, when the theater decided that they could cut down on just how many screens were showing Avengers: Age of Ultron. It got bounced around a bit when I went to see it on Friday as well; the listings all said 6:55, but when I got there, it was scheduled for 7:15, since they had apparently decided to put Mad Max: Fury Road on another screen during the afternoon. In fact, that time was cutting it pretty close (I'm guessing they didn't figure the typical twenty-minute trailer package in when rescheduling), as Fury Road was still playing when I went in the door that said "Now Seating: The Left Ear" at 6:50, and the previous movie didn't get out until about 7:14. On the one hand, great for Mad Max exceeding demand, but I was worried for a moment that I was going to be in the same situation as that whiny story getting a lot of shares/retweets about a theater cancelling a screening of Ex Machina to which they had sold two tickets so that they could sell 200 Avengers tickets. Not the case - there were a couple dozen people for this one - but I wonder if it happened earlier in the day. No trailers, so I couldn't see what other Chinese movies are on the way in the near future. Seeing that, once again, we didn't get the new Donnie Yen one, I bet Police Story: Lockdown is out of the question, and there don't seem to be many others on the schedule. Even after reading a description of this movie that I thought might give too much away and seeing the dedication at the start, I spent a good chunk of The Left Ear thinking it was going to be something else, something far more pulpy or at least soapy than the earnest narration about how Li Er is deaf in that ear but that since it is closest to the heart, tradition holds that she will know if someone whispers "I love you" in that ear. It eventually settles into the youthful drama it was meant to be, and I suppose it works well enough that way, though I'd kind of like to see director Alec Su make the oddball movie he seems to start with. As this one starts, it's 2005 and Li Er (Chen Duling) is 17, a hundred days away from her college exams in coastal Chinese city Tianyi. She's got a crush on classmate Xu Yi (Yang Yang) and bikes to school every day with doting cousin You Ta (Hu Xia). On the other side of town, dropout Li Bala (Ma Sichun) is about the same age and singing in seedy bars. She's got a thing for Xu Yi's basketball teammate Zhang Yang (Ou Hao), despite kind of being with gangster Hei Ren (Duan Bowen) and Zhang already having a rich girlfriend in Jiang Jiao (Guan Xiaotong), but Zhang says he'll be with her if she ruins Xu Yi first. And yet, unexpectedly, good girl Li Er and bad girl Li Bala become close friends. Femmes fatales, gangsters, and revenge plots - there are moments when the first chunk of The Left Ear almost feels like a Chinese version of Rian Johnson's high-school noir Brick. The filmmakers don't commit to that path the way Johnson's does, but even when it becomes more like a year of a high-school soap compressed into two hours, it's an enjoyably salacious alternative to the more nostalgic high school movies that seem to be more common than present-day ones in the Chinas (at least in terms of what crosses the Pacific). Even when the film does become that later on, it drains a bit of the maudlin sentimentality off. No horrible photography for this day, where the day was built around equal parts "I want to see The Look of Silence" and "I'm not terribly fond of music-oriented documentaries", which led to spending the afternoon at the Brattle and then heading up the Red Line to see The Keeping Room. The funny thing is, this plan actually resulted in me attending movies that I might have had a little more interest in than most, as I've had family in municipal government and competed in the math team. It actually made for a relaxing day; without Q&As and with the single screen of the Brattle making it relatively to keep things from slipping - though, to be fair, it's not like things were egregiously late at the Somerville at any point, more like a relatively constant fifteen minutes after the start time, which is pretty reasonable for trying to get folks in the rush line seated. Funny thing I heard about scheduling: The Somerville Theatre put new seats in last year (or was it the year before), which means that screens three and five are now smaller than the Brattle, which means that they get slightly higher-profile movies. I hadn't realized that the seating upgrades had quite so great an effect, and I don't ever recall them getting less interesting movies, but I don't recall often spending the better part of a whole day there, either. Here in Boston, we've recently been threatened with hosting the Olympics, and though the recent experience of the Big Dig should really have the whole city threatening to string up whoever first thought this was a good idea, there's something about the very idea of the transformative public works project that can get one excited regardless. And not only is the one in The Chinese Mayor a doozy, but it gives an interesting look at how municipal government works in China. Specifically, the town of Datong, where mayor Geng Yanbo has an audacious plan to revitalize the most polluted city in China: He intends to rebuild the city wall from when it was the capital 1600 years ago, but doing so will require razing large sections of the city and relocating their residents to a public housing development that is ambitious in its own right. As one might expect, those displaced have a great many issues with this, although Geng is still one of most popular mayors in the city's history. It's not hard to see why; filmmaker Zhou Hao shadows the longtime public official closely enough that the audience gets a good chance to see him working long hours and generally being a lot more immediately responsive to his constituents' requests than one might expect from a guy who, for security reasons, resides at a military facility. There's a genuine pleasure in watching him light into some contractor who is not delivering the speed or quality expected, and not necessarily behind closed doors. This winter, when someone made a comment on there being two biographies of mathematical geniuses up for awards, I responded that after an eternity of movies about poets and musicians whose genius apparently made up for their being substance-abusing jerks to those who cared about them, folks in the sciences were due. I do worry that if enough show up to fall into their own pattern, they'll look something like this; after all, A Brilliant Young Mind (aka X + Y) already kind of feels kind of formulaic. Man, there were no trips to freaking Taiwan (without any binding competition, even) when I was on the math team in high school! This doesn't exactly make me doubt its based-on-a-true-story bona fides, but there are certainly moments that feel like embellishment and wish-fulfillment. I'm not sure that I really ever bought into the sole girls on both the English and Choose teams each being drawn to Nathan, for instance, and the number of complicated things he picks up easily is awfully high. The last act especially seems to be full of contrivances designed to make the film more obviously dramatic. Joshua Oppenheimer's The Act of Killing is one of the most stunning documentaries to see wide release (by the less extravagant standards of non-fiction films) in recent years, presenting the sort of true-life horror we are naturally inclined to look away from in a manner so unorthodox and daring as to make averting one's gaze difficult. Though few who saw it will say that the medium overpowered the message, it is still nice to see Oppenheimer make that film's complement, a laser-focused examination of the same people and events from the other perspective that feels no less original for disposing of the previous film's unusual methodology. This one focuses on Adi, an optometrist in his forties whom we initially see watching The Act of Killing on television. He does so quietly, occasionally turning his attention to his children. Elsewhere, an old woman washes her ancient husband. They are his parents and they had another child, Ramli, who was killed during the purges of "communists" (in reality, anybody who spoke up about the Indonesian government) in the 1960s. Inspired, Adi visits some of the people who remain from that time, fitting them for eyeglasses and trying to learn just what happened to this brother murdered before he was born. If The Look of Silence is one's first encounter with stories of the Indonesian death squads, it is certainly informative and interesting. As much as the film is about Adi's search for answers and learning more about the unsavory parts of his country's history, it is perhaps most interesting for observing how decades of the silence that gives the film its title has manifested itself, burying this part of history even while the people involved remain prominent. There's weird self-censorship and some terribly tortured doublespeak in Adi's son's history class. The Keeping Room is a nicely-built little thriller that takes place during the American Civil War and which uses the details of that period so well in moving the action forward that some might miss what makes it genuinely clever: From the start, writer Julia Hart and director Daniel Barber do an impressive job of blurring the moral line between good people and the causes they are aligned with, creating a tension that can stick with the audience until well after the film finishes. After a brief prologue that demonstrates what the film's heroines will be up against, the audience is introduced to the three women living on a small farm in the south: Augusta (Brit Marling), who is the head of the household with all the men off fighting; Louise (Hailee Steinfeld), her somewhat spoiled younger sister; and Mad (Muna Otaru), the family's only slave. They are just scraping by, but are probably better off remaining isolated - though the Union Army is not particularly nearby, the two soldiers sent to scout ahead (Sam Worthington & Kyle Soller) have either gone rogue or are simply using the situation to exercise their worst impulses. Start with the surface: This is a nifty little thriller in part because Barber & Hart do an exceptional job of establishing just what a knife's edge the women are on from the very start, giving the film an air of desperation that means they actually could have skipped the prologue. From there, every thing that happens makes what Augusta and the others face more daunting, though never in a way that feels contrived or has the various pieces working against each other. Despite the smallish cast, the filmmakers still manage to find ways to pull off surprising (and lethal) escalations and reversals as the film goes on. Two big sequels this week, one thirty years coming, and apparently well worth the wait. That would be Mad Max: Fury Road, with George Miller back making crazy post-apocalyptic action after a couple decades of making movies about pigs and penguins. It's a shame Mel Gibson isn't back, but Tom Hardy's pretty great and supposedly Charlize Theron is even better. Plus, insane vehicular mayhem. It's playing in 2D and 3D at The Somerville Theatre, Embassy, Apple Fresh Pond, Fenway (including RPX), Boston Common, Assembly Row, Revere, and the SuperLux. Those theaters also open Pitch Perfect 2, which follows the college a cappella group from the first during their senior year after a scandal resets things back to zero. Fairly quiet weekend at Kendall Square, which opens IFFBoston selection Iris, the final film legendary documentarian Albert Maysles made on his own. It's a profile of Iris Apfel, a 93-year-old fixture on the Manhattan fashion scene. They also bring back New Zealand zombie comedy What We Do in Shadows. The Brattle Theatre has two premieres this weekend. First up is I Am Big Bird, a documentary following 81-year-old Caroll Spinney, who has performed Big Bird and Oscar the Grouch for Sesame Street's entire 45-year run. He'll be there in person on Friday night, although the 7:30pm show has sold out. That also includes a starring role in Sesame Street Presents: Follow That Bird, which plays at 11:30am on Saturday and Sunday. It runs through Monday. Not much call for that during the later hours, so they'll be playing Ryan Gosling's directorial debut, Lost River, in which a small family finds strange mysteries in an all-but-abandoned city. Nice cast, including Christina Hendricks, Saoirse Ronan, Ben Mendelsohn, and Eva Mendes. There's also a Trash Night presentation on Tuesday (Shredder Orpheus), and a special preview of Me and Earl and the Dying Girl (which was pretty good when it closed IFFBoston) on Wednesday, and there's a bunch of guests - director Alfonso Gomez-Rejon, writer Jesse Andres, and from the cast, Olivia Cooke, Thoms Mann, and R.J. Cyler. Once again, The Coolidge Corner Theatre has their only new opening in the GoldScreen, although One Cut, One Life will move into larger screens for the three shows where this collaboration between subject Pincus and co-director Lucia Small will play host to filmmaker Q&As and panels with guests. Speaking of guests, this month's screening of The Room at 11:45pm on Friday will feature cast member Greg Sestero, promoting his upcoming book on the film, The Disaster Artist. That's in 35mm, as is the other midnight screening on Friday & Saturday, Death Wish 3. You never hear about Death Wish 2, do you? On Sunday morning, the Geothe-Institut presents To Life!, an odd-couple film about a man with a secret and a Jewish cabaret singer in 1960s Berlin. There's also a Cinema Jukebox screening of Amadeus on 35mm Monday evening, as well as the start of a month-long "Wine & Film" series on Thursday, where Somm, a documentary on the test to become a Master Sommelier, will be paired with a tasting. Piku continues with full shows at Apple Cinemas Fresh Pond/iMovieCafe, so it must be doing pretty well. They also open unsubtitled Tamil-language films 36 Vayadhinile & Purampokku Engira Podhuvudamai, but the larger opening is Bombay Velvet, which takes place in the Golden Age of Bollywood and also opens at Fenway. Fenway also opened Mandarin-language drama The Left Ear last week, sneaking it onto the schedule at the last minute with no fanfare. It's a love quadrangle of sorts, starting out when its protagonists are about 17. The Harvard Film Archive has been showing astonishingly long films by Filipino director Lav Diaz for the past month or two, but when the guy arrives in person, what do they have? His latest film, Storm Children, Book One plays Friday night; this documentary about the aftermath of Typhoon Yolanda, and runs a mere 143 minutes. Saturday's film, "Butterflies Have No Memories", is just under an hour (it's paired with 31 minute short "Prologue to the Great Desaparecido", although that sort of serves as a trailer for him. C'mon, let him talk about one of the beasts! Sunday has a free screening of Breaking Away as part of Bay State Bike Week, and then the HFA picks the Wojciech Jerzy Has series back up: Gold Dreams on Sunday evening and An Uneventful Story on Monday. Wednesday has another free screening at 3pm, Robert Flaherty's "A Night of Storytelling". Jewishfilm.2015 concludes at The Museum of Fine Arts on Friday with The Kindergarten Teacher, in which the title character becomes fascinated with one of her students, who composes poetry far beyond the typical capabilities of a five-year-old. Kids are the focus of the rest of the weekend there, where The Boston International Children's Film Festival presents two features on Saturday (Moomins on the Riviera and Mune) and two blocks of short films on Sunday. There's also a special presentation of Angkor's Children on Saturday afternoon, with director Lauren Shaw and Arn Chorn Pond (a former refugee whose foundation is part of this film about young people reclaiming the arts in Cambodia) on hand for Q&A. I saw it at IFFBoston and it's pretty neat. The Belmont World Film Series officially ended last week, but it has a special presentation on Monday at The West Newton Cinema - Os Gatos Nao Tem Vertigens, presented as part of the Boston Portuguese Festival and showing a small-time crook in Lisbon get taken in by a lonely widow. The Capitol brings While We're Young over from Somerville, and continues "Mel Brooks in May" with Young Frankenstein at 11pm on Friday & Saturday. My plans include Max Max: Fury Road, Piku, The Left Ear, and probably more, although I really should be packing up to move. This is taking forever to get finished, so let's just get straight to the horrible photography. Left to right, that's Stray Dog producer/editor Victoria Steward, director Debra Granik, and The DocYard's Sara Archambault (along with her plus one). 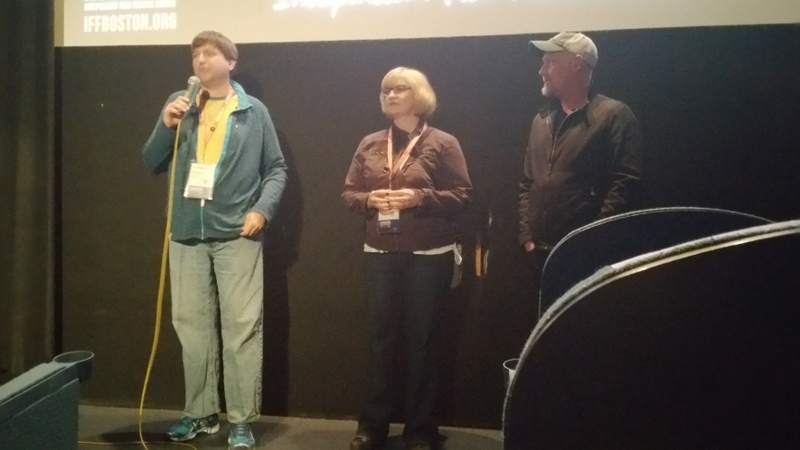 Nice folks, and they led an entertaining and interesting Q&A - as you might expect, making a film with a Vietnam veteran biker with a somewhat colorful entourage left them with some curious stories. They mentioned being very grateful to not just subject Ronnie Hill but his therapist for permission to show a session, and how editing can sometimes be surprising: Apparently, one of the things that drew them to Hall as a subject was him being this big leather-clad guy who tends toward little dogs rather than the larger breeds you might expect from a biker, and caring for dogs like that has been good for vets with PTSD. They figured that would come out more explicitly in the movie, but no opportunity came to mention it. The usual question of "have the subjects seen the movie" came up, and Granik mentioned that it's something you always plan for, although they were kind of terrified. Hall, it turned out, was "hugely amused", and apparently the therapy scenes mentioned were a part of why he wound up giving it the thumbs-up, hoping that other vets might see it and see how useful therapy can be. There were also questions about how everybody is doing now (mostly good, though the Mexican stepsons were still struggling with Missouri). I didn't have the guts to ask whether doing this after Winter's Bone was entirely her decision or an example of how women who direct a successful independent feature don't get the same opportunities their male counterparts do - not mine to ask - but I have to admit to wondering. Nobody came for H. (and I probably should have gone for GTFO, as I often amused myself during this Troy-set movie by writing down restaurant names with the intention of asking friends who went to RPI if they were any good), but there were filmmakers on hand for Lost Conquest: Director Mike Scholtz and producers Valerie Coit & Michael Pickering. Scholtz was (I think) the only filmmaker to send me an email this year, apparently remembering that I reviewed one he produced (Wicker Kittens) in a previous year. I don't know that it necessarily decided what I would be seeing in this slot - but even if I don't reply to the email you send, it doesn't hurt. Glad I did, because this was a fun movie and a just-as-enjoyable Q&A. Scholtz joked that, seeing as this movie could be seen as making fun of Minnesotans, they decided to have their world premiere as far from that state as possible, which meant Boston. I didn't really see it this way - Scholtz could have been really mean if he wanted to, but generally seemed more affectionate than taunting to me. There was one moment when the audience (myself included) did sort of gasp at what was being said, but that also solidified what the movie was really about. As Scholtz said, "I made a movie about faith, but I lured you in with funny Viking costumes". That Q&A ran long enough that I didn't even leave the theater for the line-up, just making a left turn into theater #1 for Call Me Lucky, where both subject Barry Crimmins and director Bobcat Goldthwait were on hand. Goldthwait is one of my very favorite festival guests, and not just because he genuinely seems to love coming back to Boston, or greets us by saying "for some reason, I'm dressed as Doctor Who". He's a recognizable name who doesn't just show up for his movie and then fly back home, but attends screenings (both here and in Montreal); he's also genuinely independent. I think it's mostly because he gets ideas that nobody else will touch, and he's pretty unique as a guy that people will recognize that dives into this sort of material. Which includes the life of Barry Crimmins, whose story is compelling but probably won't be something where a studio finances a biopic. Though the movie makes a pretty hard shift away from his comedy career midway through (for good reason), with even the recent performance footage more monologue than stand-up, he's still got great timing, so having him and Bobcat up there made for a Q&A that was both earnest and very funny. One fun thing learned from the film: Goldthwait's nickname came from him and then-partner Tom Kenney goofing on Crimmins (nicknamed "Bearcat") while working at one of his comedy clubs by calling themselves "Bobcat" and "Tomcat". Less fun, but interesting, was learning that Robin Williams was the one who suggested Goldthwait shoot it as a documentary, even kicking in some funding, and leading to a story about how when World's Greatest Dad closed IFFBoston, Goldthwait was in the back of the auditorium, talking to Williams on the phone, holding it up so that he could hear that the audience was laughing. In case you handn't heard, losing Williams is a damn shame. The last film and Q&A of the day was kind of an impromptu choice, apparently on both sides. I was hemming and hawing about staying at Somerville for Day Release or heading to the Brattle for Deathgasm, but I gambled that with the latter being a decent-looking horror-comedy featuring metalheads, the only thing that would prevent Mitch Davis and company from booking it at Fantasia would be it receiving Canadian distribution, and I was right there - it's on the initial list of films booked for Fantasia this July. 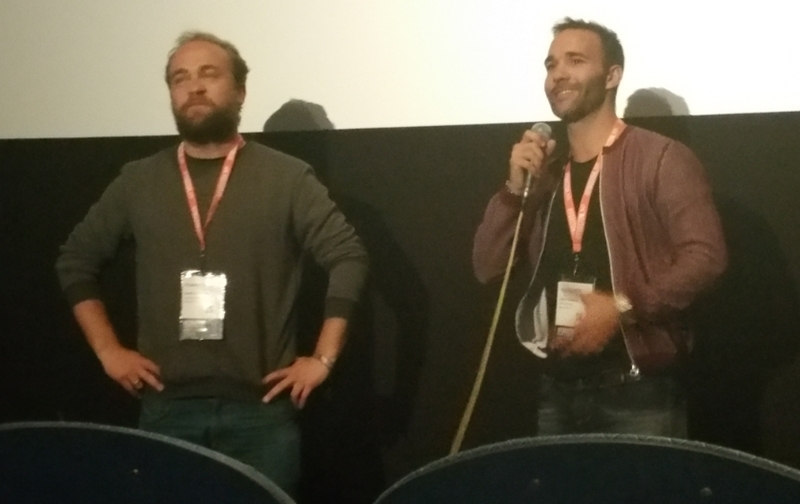 Meanwhile, director Geoffrey Cowper and star Jesus Lloveras (above) said that they made a last-minute decision to road-trip to Boston after appearing at the Chicago Latino Film Festival two days earlier. Maybe that's exaggerated, but I don't care, because it's a fun story, as is the film getting made because Cowper's grandfather put up the money and now enjoys calling himself a film producer. Cowper also mentioned that the opening titles say that this was based upon a true story because they are fans of Fargo and, like the Coens, enjoy seeing if they can get an audience to take a movie more seriously by saying that. Basically, it was inspired by an armored car robbery that took place near a mall where either he or Lloveras (who co-wrote the film) was working, although everything else is fabrication. He also described that the sort of weekend release the film's main character was on isn't terribly unusual in Europe compared to America. Nobody in the audience mentioned that such a furlough was a big part of torpedoing the presidential campaign one of our state's former governors. Well, that's a lot of movies. Hopefully, getting caught up on this festival is all downhill from here. You may have heard of director Debra Granik's previous film, a great backwoods number called "Winter's Bone" that got a bunch of praise and is arguably the foundation for Jennifer Lawrence being as big a star as she is, so it's a bit surprising to see her next feature be this very small-scale documentary; in a lot of cases, one would think, she'd get a chance at something bigger. On the other hand, since she met the subject(s) of this movie on the set of that one, maybe making this her next project felt like a more natural next step than trying to grab some studio job. This movie is focused on Ronnie "Stray Dog" Hall, a Vietnam veteran and biker who operates a trailer park in Branson, Missouri. He's a pretty good dude, letting tenants who are down on their luck slide, learning Spanish to better communicate with his wife Alicia and her sons (19-year-old twins still residing in Mexico City), and taking part in a lot of commemorative programs and rides. He's a big-hearted guy, whether he's around family, friends, strangers, or the for small dogs who live in his house. Being generous of spirit does not make him uncomplicated; an early session with his therapist drops a bit of information that will certainly stick in the audience's head through the rest of the movie, even if Granik never really returns to it. It's one of several things we observe about Hall that intrigues, even if it is in large part built out of how Granik emphasizes things: That scene is isolated, while a relatively uninterrupted string of scenes that focus on him attending events memorializing the Vietnam War are almost fatiguing. A viewer may get restless, finding it almost sad that Hall's life has never moved beyond that point. That's not necessarily what one thinks of as good editing, but bogging down here is useful, driving home just how large that experience looms in a veteran's life. Movies like H., with its deliberately un-evocative title, unexplained strange events, and ostentatiously non-standard structure, can bring out my least favorite reaction to a movie - the urge to shoot that the emperor has no clothes and the audience is being played for suckers who don't want to admit that they can't see what's going on. Most of the time, I can see that there's some idea at play, even if I can't get at it because it's poorly thought out or expressed. That's where I stand with H.; it's too well-executed to dismiss but far too messy to praise. The film is broken up into chapters, with the first focusing on Roy Brajisky (Julian Gamble) and his wife Helen (Robin Bartlett), longtime residents of Troy, New York. They have been growing distant of late, especially with Helen becoming obsessed with her extremely realistic "reborn baby doll", which a number of older women in the area have purchased; they're meeting for a party at the Brajiskys' later. The second brings the focus to Alex Kovacs (Will Janowitz) and Helen Castro (Rebecca Dayan), artists expecting their first child, though Helen frets about Alex leaving her. Also located in Troy, they are on the front lines when strange things start happening in the city, perhaps related to the meteor that's been seen in the sky. 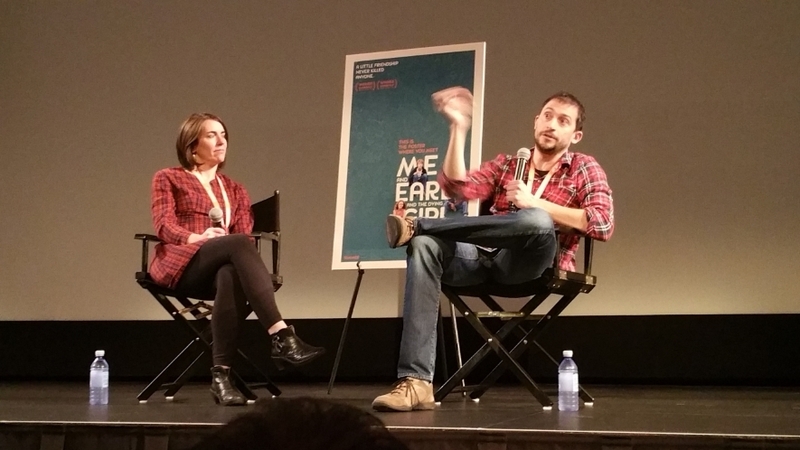 There's clearly something going on here - filmmakers Rania Attieh and Daniel Garcia don't just give their female leads the same first name and motherhood-related stories that are even more parallel than they first appear randomly, after all. When Attieh & Garcia focus on those ideas, they really seem to be on to something; Helen Brajisky and her doll go from kind of funny to genuinely unnerving very quickly, and while the other couple's story relies more on the paranormal incidents to put the audience on edge, the dynamic between these controversy-courting artists facing a potentially more conventional life is potentially fascinating. The comedic documentary is not exactly rare, but it is generally reserved for people famous for being funny - after all, if something is funny, it is seldom considered important enough for a film that gets any sort of wide notice. That's unfortunate, because it means that Lost Conquest is a rarity - a film that is actually able to sneak an important idea into a group that might not otherwise consider it, while still being tremendously entertaining. The film begins with an a bit of text stating that Minnesota was the "Vinland" that Leif Ericsson discovered a thousand years ago, according to some, although with a bit more of a wink than that. The evidence is a stone tablet covered in runes discovered by farmer Olof Ohman around the turn off the twentieth century, and though its provenance is questionable at best, this has not stopped a number of museums housing or and other supposed Norse artifacts from popping up, with the idea becoming as much a part of the region's identity as it is a cottage industry. Despite it generally being accepted in academic circles that the Vikings only made it as far as Canada's maritime provinces, could they have reached the Land of a Thousand Lakes? It's common to ask whether someone other than the person that wound up making a movie could have done so, but I think it's a fair question with Call Me Lucky. 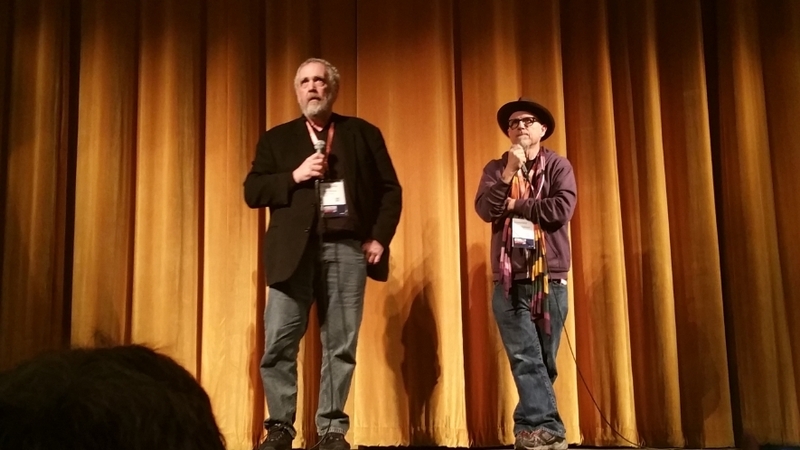 Subject Barry Crimmins and director Bobcat Goldthwait go way back, so there is trust there, which is important. Perhaps just as important, though, is that Goldthwait is a guy willing and able to make the movie that the material demands, whether that means going from funny to uncomfortable or making a documentary rather than the narrative he'd originally envisioned. Crimmins, who has returned to upstate New York after spending much of his adult life elsewhere, was a stand-up comic of unusual sharpness and political outrage during the Reagan years when that was not necessarily in fashion; he would also become a driving force in the Boston comedy scene, discovering and encouraging people from Goldthwait to Kevin Meaney to Lenny Clarke. And then, during a set at Stitches in 1992, he dropped a bombshell during his monologue that stunned everybody. Goldthwait has often been one to build his movies by stretching comedy over some pretty dark material, though it's easy to miss at least the extreme of it here. Crimmins is a curmudgeon both now and then, but Goldthwait tends to paint the biting comedy of the younger Crimmins as focused and perceptive rather than that of a man lashing out because of the injustice done to him. Goldthwait approaches the first half of the film in much the way he might handle a more conventional look at a comedian's life and career, talking with his peers, showing some footage, and spotlighting the times Crimmins staged something larger-scale than standing on a stage and telling jokes with a beer in his hand. Any hints at what's to come are planted quietly. There's a casual feel to certain crime flicks that makes them seem simultaneously streams and natural, like they take place in a more impulsive parallel universe where what makes a good story more easily trumps good sense and is much easier to just drop into a situation and be part of it than it may be in reality. Day Release tries for that and mostly manages it, although sorting up the foundations just a bit wouldn't hurt. Mark Rodriguez (Jesus Lloveras) has screwed up a lot in his life, although the way his brother Toni (Javier Beltran) describes him - a "drug-trafficking murderer" - is probably more harsh than necessary; that sort of reprobate doesn't tend to get parole after just five years. Pushed away by Toni, he decides to check in on Mia (Sara Casasnovas), the girl he rather rudely kicked out of his cast when they woke up in the back seat in the morning. That may be his best decision of the day, although when he walks out of the cafe where she works, there's an armored car being violently robbed in the parking lot, and he decides that his best course of action is to follow the perpetrators afterward. Stories built around guys like Mark must be tough nuts to crack - the odds are against him whether it comes to out-fighting or out-thinking his opponents, and there's not really any sort of hidden quality likely to give him any special chance to succeed. It winds up making Day Release a caper movie where the protagonist is very much in over his head, and that's kind of a wobbly thing; watching Mark come up with a plan and execute it isn't quite the same sort fun as when things really slide into place. At the same time, it never exactly feels like Mark is suffering from terrible hubris.